Sometimes a guitarist might want to reduce their acoustic guitar string tension. So how do you get a guitar that produces less tension? String tension is mostly a factor of the strings used and the scale length of the guitar. There is only one way to do this and that is to get a different guitar with a shorter scale length. If you are yet to buy your first guitar or are looking for a guitar for someone else and you know they’ll need/want lower string tension, then pay attention to the scale length. Just quickly, scale length is measured by taking the distance between the 1st fret and the 12th fret and multiplying it by 2. Essentially, though, scale length means you are taking a string that is stretched over a smaller distance but to the same pitch – this reduces the tension on that string but achieves the same pitch. Apart from String Tension what else does scale length effect? What this also does is reduce the distance inside the frets. There are still the same amount of frets but the amount of space for those frets to fit into is smaller. This is great for those with small fingers because they don’t have to stretch as far between frets. But it can be an issue for those with big fingers, when you start to get to the upper frets. Usually smaller bodied guitars have shorter scale lengths, though the scale lengths of larger bodied guitars do vary. Classical (Nylon string) guitars actually have a longer scale length than Acoustic (steel string) guitars. Despite this, there is still considerably less tension on the strings of a classical guitar than there is on an acoustic guitar. The reason for this is the strings. Classical guitars have nylon strings – which produce considerably less tension than steel strings. This brings me to the next factor in string tension – the strings themselves. You may already have a guitar with a full scale-length and not want to buy another one. The other way to reduce string tension is through the strings themselves. As mentioned above, classical guitars have nylon strings and those nylon strings produce less tension than the steel strings that are used on an acoustic guitar. But there are also different steel strings that produce different tensions to others, depending on the materials used and the gauge (thickness) of the string). Classical guitar strings actually come in different tensions – they have different gauges like steel strings but they also come in different tensions. But even the high tension nylon strings won’t have the same tension as steel strings. Steel strings come in a few different varieties. Some varieties will produce more tension than others. Materials used and the gauge of the string will both effect the amount of tension exerted on the strings. Usually the 1st string and 2nd string are unwound and the 4th, 5th and 6th are wound with something. The 3rd string is sometimes wound and sometimes not. The material that the wound strings are wound in will effect the tension. Silk and Steel strings, for example, are wound in silk or nylon (or copper that has silk running through it). These produce less tension than other winding materials such as bronze and phosphor bronze. The string gauge also plays a part in tension. The thicker the core of a string the more tension it’s going to produce. So, light gauge strings will produce less tension than heavier gauged strings. So, if you haven’t already, you could try reducing the gauge of string you use to see if that gives you a tension that you’re more comfortable with. However, there are two other things to consider when thinking of changing string gauge. If you have a certain gauge of string on your guitar, then the guitar is likely to be set up for that gauge. If you change down by more than one gauge – e.g. if you were to go from Medium (13s) to Extra Light (10s), then you would need to have your guitar set up to work with the 10s. Usually just going down one gauge you shouldn’t need a set up. You’ll also have to weight up your sound preferences with string tension. If going to a lighter gauge makes your guitar sound hollow and tinny, or simply not to your tastes, then it may not be worth the trade off for the reduced tension. On larger bodied guitars especially , super light gauge strings may not sound as good as heavier gauges. If you want to get really technical on this subject you can check out D’Addario’s tension chart at the next link. If you want some other ideas for reducing tension you could check out the next link. >>String tension: More to do with scale length or actual type of string? 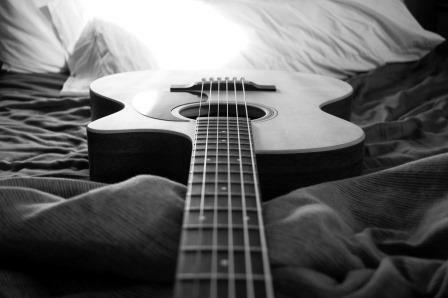 I hop this post has helped you to work out some ways that you can reduce your acoustic guitar’s string tension – for whatever reason you want to reduce it. If you have other reasons you want to reduce your tension or if you know any other ways that are good for reducing string tension, feel free to leave a comment in the comments section below. All other comments and questions welcome too. Acoustic guitar newbies are interested to know how to reduce string tension. I am sure this will help them a lot. Great idea for sharing! * Use electric guitar strings. This option does require changes to the setup of the guitas since the tension is so much less. It also reduces the sound level and affects the tone more than the other options. It is a great solution for those with arthritis in their finger joints, and younger children. It allows me to switch between my electric and acoustic guitars without much change in the feel. Thanks for your input. Good to hear some other methods for reducing string tension.